According to the WSJ, GoPro is the largest consumer hardware IPO in 23 years, though like most entrepreneurs, I don’t remember the Duracell IPO. The last consumer hardware company IPO I remember is Tivo, which was in 1999. Because GoPro is the first sizable consumer hardware IPO in eons and because the startup world has a blossoming hardware segment, I thought it would be interesting to compare and contrast a top consumer hardware startup with the benchmarks of public SaaS companies using GoPro’s S-1. I have three goals with this analysis. First, to understand GoPro’s business better. Second, to benchmark GoPro’s capital needs, capital efficiency and attractiveness to investors. Third, to draw conclusions for other hardware startups. Founded in 2004, GoPro is about 10 years old and during the past few years has witnessed spectacular growth. In its sixth year in business, the company generated $65M in revenue and in its ninth year, just short of $1B. The revenue figures and the annual growth rates of the business are depicted in the chart above. It’s astounding for a business generating $500M in annual revenue to grow more than 100% in a year. In comparison, the median public SaaS company grew 40-58% in years six through nine, reaching about $100M in revenue. To be fair, there are significant differences in the subscription revenue of SaaS companies and the one-time, transactional revenue of a consumer hardware business. In particular, subscription business is far more predictable than consumer purchasing habits. The second major difference in revenue is the gross margin. 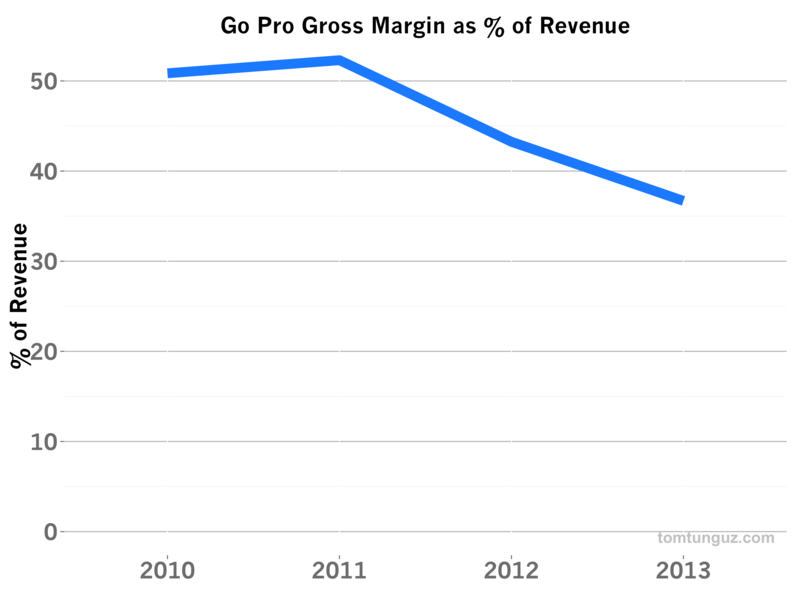 GoPro’s gross margin has dropped from 50% to 37% in four years. The chart above shows the decrease in gross margin. The company has witnessed an increase in the Cost of Goods Sold (COGS) in the past few years. According to the GoPro S-1, COGS include the components of the camera, the shipping costs, the selling costs, warranty and replacement costs, and write downs for excess inventory. SaaS companies benefit from the elasticity of the cloud. As a result, there is no true need to predict demand aside from hiring the staff to support customers. Consequently, public SaaS companies operate with a 67% average gross margin, roughly twice that of GoPro. Let’s dig a bit deeper into GoPro’s cost structure. 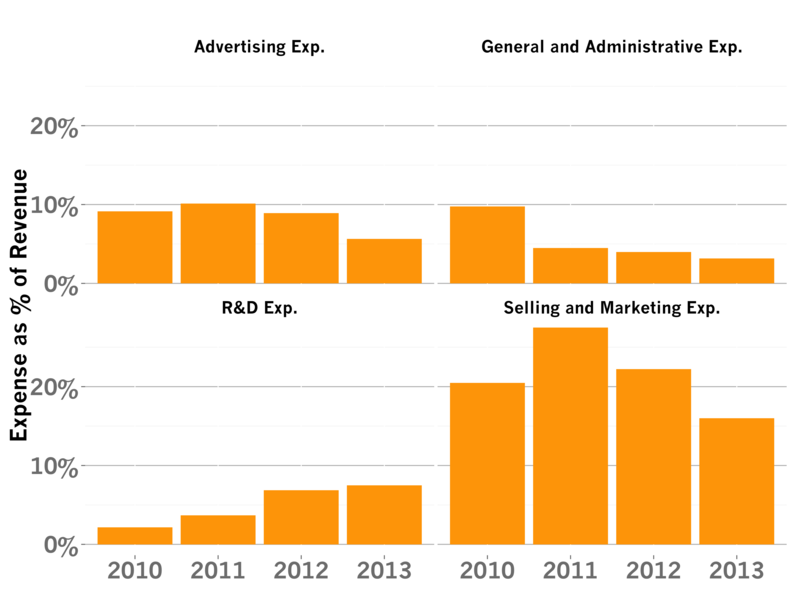 The chart above shows the four different expense categories GoPro reported in its S-1: Advertising, General and Administrative, Research and Development, and Sales and Marketing. I’m not intimately familiar with the company but I’ll hypothesize about the trends behind this data. Advertising expenditures have fallen as a percentage of revenue. Perhaps the company has de-emphasized ads a growth channel because the brand has become synonymous with the category and the majority of the market is aware. G&A expenses have likely fallen as revenues have increased dramatically, but staff have grown at a slower rate. R&D expense seems to is increasing. Given the amount of competition in the market from Contour, Sony, Canon and others, and that the product is using, as far as I know, commodity semiconductor and optical components, GoPro must continue to invest in product differentiation including better cameras and better software, which they provide for free. Selling and marketing expenses increased and fell. I suspect GoPro sells most of their hardware through retailers. As the company has increased its sales throughput, it likely has been able to negotiate much better terms with retailers, thus decreasing selling and marketing expenses. These investment trends, particularly the R&D investment trends differ substantially from SaaS companies, which spend more than twice as much in Sales and Marketing, about 50% of revenue, and about twice as much in R&D - about 20%. Because SaaS companies have substantially higher gross margins, they can afford to invest more in both functions. 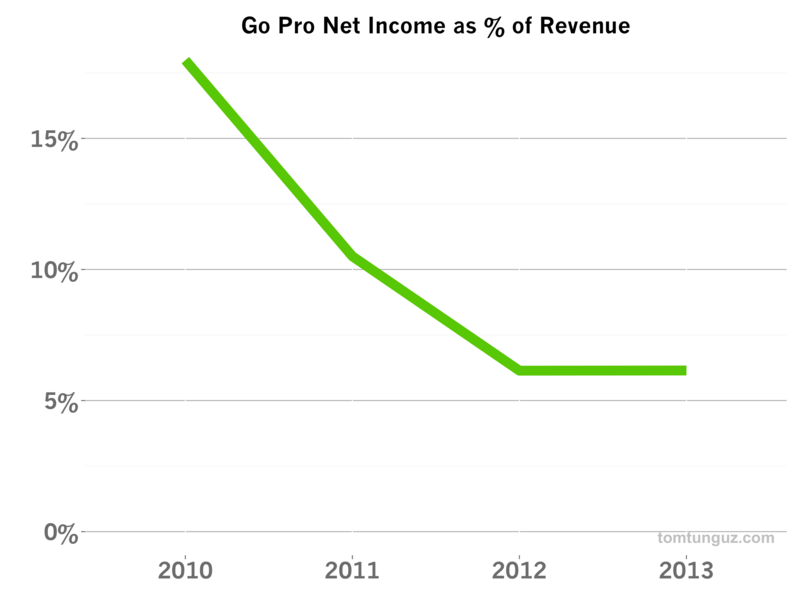 Let’s look at GoPro’s Net Income trends. The company has been profitable for the past four years at least, but before its IPO, Net Income fell to about 5% of revenues. Contrast this trend with the average of -18% Net Income of the average SaaS company. SaaS companies have been telling the market that the long lifetime values of subscription customers enables higher spending to achieve higher growth. Again, this ties back to the difference between transactional revenue and subscription revenue. 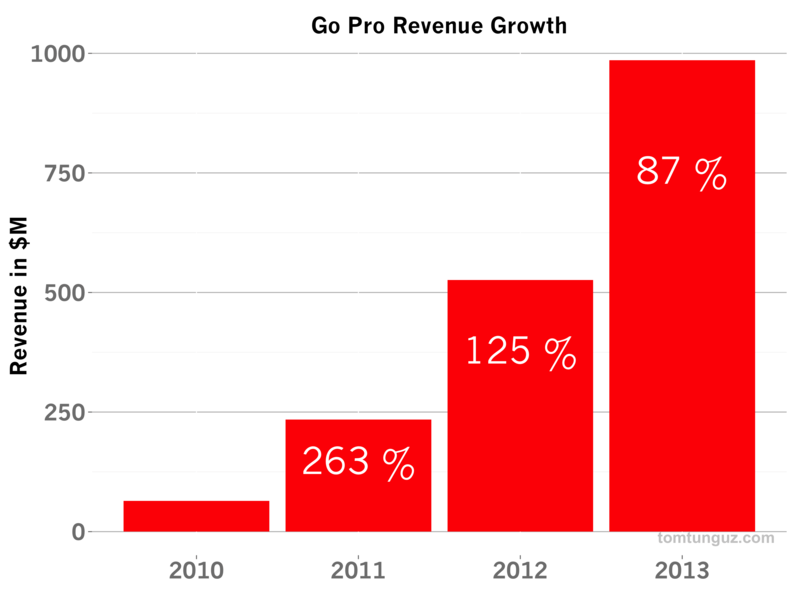 GoPro aims to be profitable with one customer on the first transaction, hence better profitability. One of the refrains about hardware businesses is their capital inefficiency. Because hardware companies must spend money to manufacture goods and typically are only paid once the consumer buys the device, hardware startups may have huge amounts of money tied in working capital. But GoPro bucks this trend. In a previous analysis of SaaS companies, I calculated a figure called Return on Invested Capital (ROIC), which is the ratio between the revenues of the company the year it went public to the amount of venture dollars raised. In other words, how many revenue dollars did one invested VC dollar create. The average for the most recent SaaS publics is 2.0, two dollars of revenue per investment dollar. 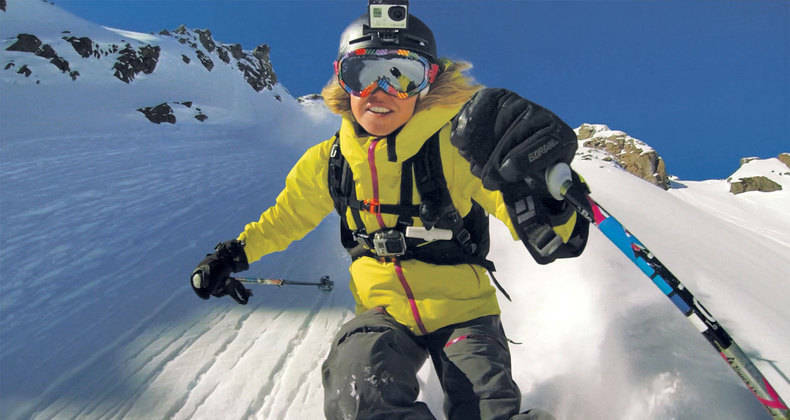 GoPro’s ROIC is 3.4: $288M raised and nearly a $1B in revenue. 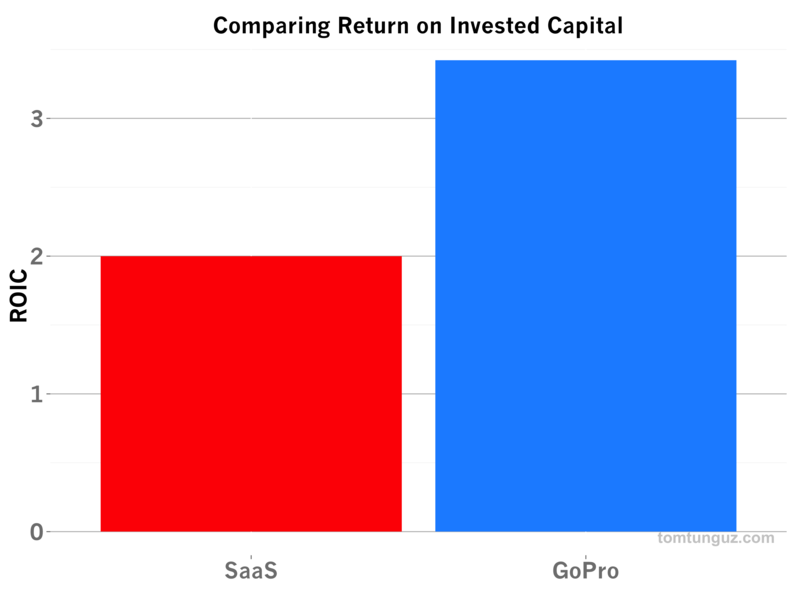 Amazingly, GoPro is 50% more capital efficient than the average SaaS company. Of course, GoPro does have a debt line of about $100M to finance inventory. The median SaaS company with debt, operates with $55M in short and long term debt, for comparison. Given all those data points, how ultimately does an incredibly fast-growing, relatively high-margin consumer hardware company perform in the public markets compared to SaaS companies? GoPro more than doubled in its first few days of trading and as of today, the company trades at a ratio of 5.3x (Enterprise Value to LTM Revenue), which is precisely half of the average SaaS company. There’s no question GoPro is an exceptional company, and it wouldn’t be an overstatement to call it a once-in-a-generation company. Now worth more than $5B, GoPro is a terrific example of what is demanded of a consumer hardware company to become publicly traded. GoPro defined a category, developed a brand, sustained amazing growth rates and has invested to attract new customers and defend its existing customer base. It’s a great role model for hardware startups to follow.